1250 strongly agrees with Greenpeace that it is vital to save the arctic and to preserve it as a sanctuary. However, this is not possible unless it is kept frozen. 1. Addressing regional black carbon levels through point-specific programs, such as diverting flights away from the arctic; creating a system where ships would be required to wear high-efficiency black carbon filters while traversing arctic waters, which they could return upon exiting the region; globally coordinated high-latitude peat and other forest fire suppression programs, etc. 2. Environmental remediation projects: examples of this include things like breaking up of fall sea ice around key regions, to help thicken it and maintain it longer into the melt season; similar programs along key rivers such as the Lena; impeding spring ice-breaking; introducing bison or other herbivores into northern Siberia and parts of Canada to help harden snowpack, prevent new shrub growth, and restore the natural early-Holocene tundra-steppe ecology, which could prolong snow cover during the spring melt, lower albedo and helping regional carbon stores remain locked up. 3. Possible methane trapping systems: Nobel laureate chemist George Olah has written of “the methanol economy,” and one could imagine an “arctic preservation methanol economy.” That is, certain areas, particularly around the Lena delta, are already beginning to produce rich enough streams of methane such that trapping these emissions, when coupled with investment in a methane-methanol conversion facility located in or around nearby Tiksi, could be worthwhile, and might eventually become a funding generator either for other parts of the remediation program or for expanding into more challenging methane sources. Stephen Salter, a leading engineer working on marine cloud brightening, and 1250 member, has also designed sheeting for trapping arctic fugitive methane emissions. Just as 350 might never be possible without 1250, it is now also likely that 1250 might not be possible without these direct interventions in the arctic climate system, as methane emissions from melting permafrost and other carbon stores could soon start to be added more quickly than we could possibly take our own methane emissions down. 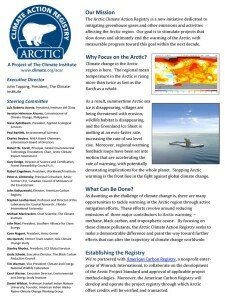 This voluntary program of the Climate Institute has the majority of the 1250 Arctic Rescue recommendations included in it, has already received widespread support, and has a Steering Committee representing major figures from the Worldwatch Institute, the National Wildlife Foundation, the Heinz Institute, and scientists such as Robert Corell. Join us in our campaign to help the long-term climate by starting with the climate we have right now. Let's all bring methane and black carbon down together, and staunch the arctic death spiral. We will let you know when we have news, and make you part of the 1250 movement. Hate the Increases in Storms and Heat? Take Methane Down to 1250 Now!